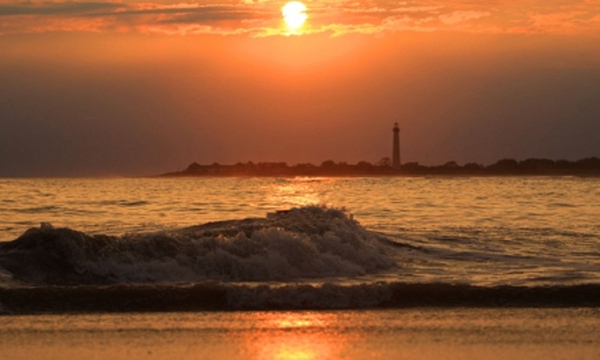 I’m sure that many of you think of Cape May as a summer destination. I know that MANY of you have already discovered that it is much more than that. In fact, I’m willing to make the argument that the Fall is when Cape May is at its finest. So how can a beach resort be better in the “off” season? There are actually many reasons for it. First of all, September and Early October usually have the best, most pleasant weather of the year. That has certainly been true so far this September. The weather has been PERFECT, as many of you can attest to. Further, the crowds of summer are gone, but all of the features that distinguish Cape May from any other beach town are still fully present. All of the restaurants are still open (but they’re not as crowded). All of the shops are still open (and they’re putting everything on sale so they don’t have to carry it through the winter). Our rates are lower, (we even have mid-week discounts for those of you with flexible travel schedules). Traffic to and from Cape May is a breeze. Beyond all of that, Fall is “Event Season”. As I write this we are wrapping up the Food & Wine Festival. In a couple of weeks we’ll be enjoying “Victorian Weekend”, which is probably one of the most exciting weekends of the year, jam packed with fun activities. The Halloween season is always big (and long) in Cape May. And of course, there is nothing quite like Christmas in Cape May, which starts in late November. Luckily for you, we still have some availability for most of our Fall weekends and a fair amount of availability for the mid-week. If you haven’t experienced Cape May in the Fall, I suggest you consider it. Some rooms have an intangible quality that make them special. Bloomsbury is one of those. It isn’t our largest room, and it doesn’t have an ocean view, or a fireplace. Despite that, Bloomsbury is one of my favorite rooms. So what makes it so special? As I said, it is an intangible. Every time I walk in the room, I get a happy feeling. Bloomsbury is a very bright, cheerful room with lots of windows (great for opening up to enjoy the pleasant ocean breezes at night!). Perhaps it is those windows that make it so cheerful and happy. Maybe it is something else. Whatever it is, I like it and I’m pretty sure you will too. Bloomsbury is currently available for the entire first week of October, perfect for your Oktoberfest celebration! And The Winner Is … The Queen Victoria! I’m very proud to announce that The Queen Victoria has been voted the “Best of Cape May” for the 8th straight year. Thank You So Very Much for taking the time to cast your ballot and make us #1 again. Better yet, you voted us #1 in all 3 categories that we were contending for this year: “Best Bed & Breakfast”, “Couples Friendly”, and “Favorite Victorian Building”. With October just a few days away, I can’t help but think “Oktoberfest”. I don’t drink as much beer as I did in my college days, but the thoughts of enjoying a pint or two of that magical beverage on a bright, sunny afternoon are very compelling. Can’t you just picture yourself strolling down the middle of Jackson Street, past the wonderful aromas of grilling sausages and the sounds of the inevitable “Oompah” band, enjoying the Oktoberfest festivity as you make your way to the beer garden at the Mad Batter? If you’ve never experienced an Oktoberfest, or at least not the Cape May Oktoberfest, then you should add it to your “must do” list (you’re too young to refer to this list as a bucket list). Jackson Street is blocked off to traffic, filled with vendors selling all sorts of stuff that you must surely need. The atmosphere is festive, and everyone is happy. What better way to spend a day? I can’t guarantee that there will be beautiful young German women serving tankards of beer in traditional garb (in fact, I’m pretty sure there won’t be), but I’m confident that you’ll have a great time if you attend. Victorian Weekend has always been one of the biggest, most eventful weekends of the year. This year will be no exception, with a truly impressive line-up of events. That is a pretty decent list. It is hard to imagine not having a great time that weekend! Every October birders from all over the world converge on Cape May to experience the amazing migration. During the Fall migration, the focus is on the “raptors”, or hawks that are passing through Cape May on their way to their warmer southern destinations. 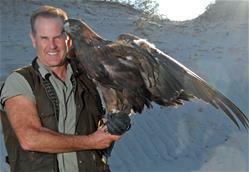 October is also when the Cape May Bird Observatory hosts their annual Fall Festival of Birding. This three day event is full of events for folks interested in searching for and observing our feathered friends. This year they are bringing “The Bird Show” back to town, featuring Jonathan Wood’s Raptor Project, a stunning collection of live hawks, eagles, owls, and falcons with multiple interactive shows per day (pictured here). For the first time ever, entry into the Convention Hall is FREE for this event and open to the public. Even if you’re not hugely into birding, there are enough interesting things for you to do and see that I’m sure you’ll enjoy checking it out. It is pretty hard not to be fascinated by the incredible diversity of winged wildlife that passes through Cape May each year. The Exit Zero Jazz Festival has quickly become a very successful and wonderful semi-annual event. 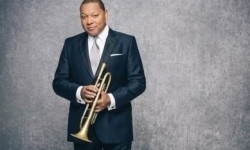 This November it returns with an incredible line-up of talent, including the famous Wynton Marsalis (pictured here). We only have a couple of rooms left for this weekend, and I know you wouldn’t want to stay anywhere else in Cape May. Give us a call soon to secure your room for the weekend! This is a little early for me to feature an event that doesn’t occur until next year, but I’m so excited about this particular event that I can’t help myself. Last year one of the event’s perennially most popular performers, and a good friend of ours, Avi Wisnia (pictured here), performed an exclusive concert for the guests of The Queen Victoria. It was a great performance and a good time was had by all. We put out a nice buffet of hors d’oevres, many guests brought bottles of wine, and everybody enjoyed themselves immensely. 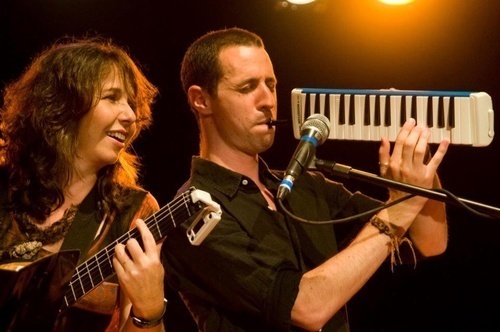 Avi has graciously offered to perform for us again this year, so we’re doing it all again! On Saturday March 19 we’ll turn our regular afternoon tea into a concert reception. I know it is going to be even better than last year. I hope I’ll get to see you there (here). Everybody asks us what that cute little cottage in the back of the Prince Albert Hall yard is. It IS cute, and it is a very popular room for many reasons, not the least of which is the cozy private porch. Cute as it is, however, the porch railing, support posts, gingerbread (or lack thereof! ), have always been a little lacking in charm. That is all changing now. Once we saw how great we could make the fence hiding our new generator look, we decided that we wanted to spiff up Regent’s Park a bit. As you can see, we basically started over, replacing the support beams for the porch roof with hand-carved custom posts, along with gingerbread, both of which match the porch of the Prince Albert Hall building. What an upgrade! As I write this, we’re still in the process of installing all the elements, which will probably take a few more days. We also discovered that we had a few issues with the foundation of the building, so we’ve fixed those and are re-siding the building as well. As usual, every project takes on a life of its own, expanding well beyond the original vision. It is one of the joys of taking care of an old property. Make sure you check out this great new look during your next visit to The Queen Victoria. A Great Gift for (almost) Any Occasion? 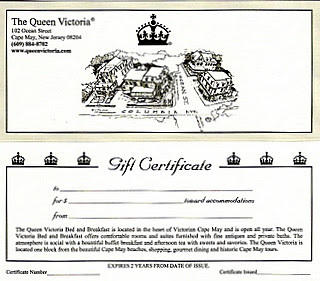 When isn’t a Queen Victoria gift certificate appropriate? There might be a few others, but as you can see, it is all about timing. Given enough time, all of those poor children who won’t be receiving this perfect gift for their big occasion will be growing their way into occasions which do qualify. Timing is everything in life! This is what it has looked like on the Cape May beach the last few days. I’m not exactly sure what is causing it, but we’ve had some pretty serious wave action lately. The surfers have loved it. There is nothing quite like sitting at the edge of the beach wondering if the next wave is going to clear the crest and reach your chair. I can sit by the beach and watch the waves roll in all day long. Somehow I never tire of it. Anna Marie and I have always loved bringing home a memento from places we travel to. The best kind are decorative home decor items which remind us of a wonderful vacation. Christmas ornaments have always been a great choice when we can find nice ones that really remind us of the trip. Given all of that, it is simply a shame that it is not possible for Anna Marie and me to vacation at The Queen Victoria (you can’t vacation where you work, especially if you happen to own the business). It is a shame because we would be THRILLED to find such a memorable, adorable, and high quality Christmas ornament to take home with us from a vacation. I can honestly say that we’ve never found a Christmas ornament anywhere we’ve ever traveled to that was nearly as nice a reminder of our trip as this ornament would be. Thankfully, you don’t have that problem. Be sure to visit our gift shop during your next visit to The Queen Victoria and check out our ornament. I’m pretty sure you’ll agree that it would make a great memento of your time in Cape May. I’m probably not breaking new ground with a suggestion that you partake in some wine tasting on your next visit to Cape May. The wine industry really started taking off in the Cape May area just about the time that Anna Marie and I purchased The Queen Victoria in 2004. Ever since then, wine tasting has been one of our favorite “go to” forms of entertainment when we have a few moments to ourselves (especially if it is not a good beach day). We recommend that you take lunch or some goodies (perhaps one of our Queen Victoria Artisan Cheese trays) to the winery with you and make an afternoon of it. Don’t try that at Willow Creek, however, as they are not BYOF (Bring Your Own Food) friendly, though they are eager to sell you some. Everybody needs to have a favorite Italian restaurant, right? When Cucina Rosa closed last year, Anna Marie and I had to come up with a new favorite. It wasn’t hard. We first tried Sapore Italiano late last summer when we accidentally discovered they had opened up for business in the former location of Copper Fish/Cape May Smokehouse/Moonfish Grill/Daniels (depending upon your time frame of reference). We loved it on our first visit, and every time since. With Cucina Rosa now eliminated as a choice, we need not feel guilty proclaiming Sapore Italiano our new favorite. 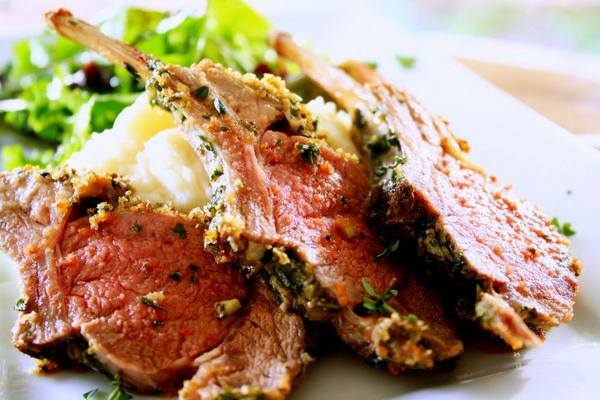 Sapore Italiano has a BIG menu, with lots of options. Take a peak at the menu and you’ll find sections for “Antipasti”, “Insalata”, “Pasta”, “Pasta de Mare”, “Rissotto”, “Pollo”, “Carne” (which is mostly veal), and “Pesce”. The variety of sauces in each seems nearly endless and includes all the traditional favorites and a few you probably haven’t heard of. We enjoyed a wonderful meal at Sapore last week. Anna Marie ordered the Pollo Francese, which she adored. I tried the Pollo Saltimboca, which was incredibly good. After the complimentary antipasti plate and generous basket of grilled Italian bread, there was no way we could even contemplate ordering dessert. Happily, Sapore Italiano is a BYOB too, making it even more affordable than it already was to enjoy a great meal.